A Bittner Art Book, c1958, no other printings listed, 1st Edition, 126 pages. VERY GOOD Condition Impressed Illustrated Hardcover with a GOOD+ to VERY GOOD Condition Dust Jacket protected with a Mylar Cover. This book is ex-library with usual markings, light wear to book edges & very light dj wear with a few tiny edgetears and lower front flap corner clipped (nothing removed, price remains on upper corner). Pages & Binding are NICE & TIGHT! In this volume, John Rewald displays an unusual sensitivity and insight into the artist and his creative expression. 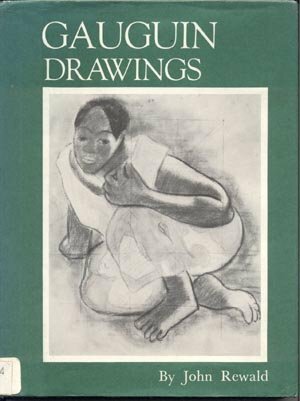 There is no other publication (written 1958) devoted to Paul Gauguin's draftsmanship, yet as Mr Rewald points out, Gauguin's drawings were his most intimate works. As the artist wrote shortly before his death: "A critic comes to see my paintings, and somewhat hesitantly, asks for my drawings. My drawings! Oh, no! They are my private letters, my secrets." This book is FILLED with Wonderful Art Plates of Paul Gauguin Drawings!